The mobile phone-tablet hybrid category was created by the first Samsung Galaxy Note. Its latest model - the Samsung Galaxy Note 3 - has its biggest screen yet and lots of new features but does it have what it takes to make it into our list of the best smartphones to buy? Set to go head to head with other big-screened devices such as the Sony Xperia Z Ultra, HTC One Max and Nokia Lumia 1520, as well as smaller flagship devices like the iPhone 5s, HTC One and Samsung Galaxy S4, this so-called 'phablet' is a gadget for the larger hand. Even when it's slim, it's a real palm-stretcher and it's just too big for littler digits. Still, props to Samsung for creating this model with a bigger screen than the last one but in a slightly smaller case. The Note 3 measures 151.2 x 79.2 x 8.3 mm, which is about the same height, half a millimetre narrower and a full millimetre thinner than the Samsung Galaxy Note 2. More impressively still, the 168g weight is a full 15g lighter than last year's model. That's partly down to the plastic casing on the back. It's cunningly fashioned to look like leather, complete with stitching details but when you peel it off you see how slim and, er, plasticky it is. Even so, this is a more sophisticated look than many of Samsung's recent phones can muster (step forward, the Samsung Galaxy S4). And although it's a thin, light back plate, it fits so perfectly there's no creak when you flex it. It won't be to everyone's taste but it's certainly a well-built phone. What's more, the glossy metallic edging and gloss white frame round the screen look chic and classy. The Note 3 comes in a bunch of colours. They include white, black and pink. 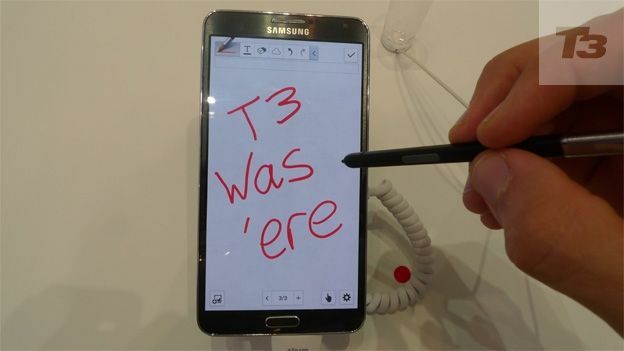 This is a Note, so there's a stylus built into the body, called the S Pen. It's so you can annotate the screen, for instance. As you pull it from its snug holster the Note 3 recognises you've done this and launches a special menu called Air Command. The options in the menu include Action Memo. So, for instance you can scribble a phone number down on the screen. Then the phone recognises that's what it is and offers you menu options including a phone dial icon. Touch this and it'll phone your scribbled number. Cool, huh? A line of an address can lead you to a map, too. Other S Pen options include Screen Write which takes a grab of what's on screen and lets you annotate this. The S Pen also lets you scribble on screen and the handwriting recognition does an okay job of translating it into text. Samsung has put a lot of its trademark apps into the Note 3 including the excellent S Translate which lets you speak in one language and hear the phone speak them back in another. It's very useful and works splendidly. This is the first phone to work with the Samsung Galaxy Gear smart watch. It's a good combination. With a screen this size you may well find yourself in situations where you want to keep the Note 3 in your pocket or bag, in which case being able to read the first line of a text or email on your wrist is easier, not to mention making a call on it. The display this time around is 5.7 inches – last year it was 5.5 inches. It's bright and sharp. And because it's a Super AMOLED screen, it's amazingly vivid. Sometimes eye-searingly so. This is a Full HD screen, just like the Samsung Galaxy S4, though the pixel density is obviously a little lower as this is a bigger display. Even so, it looks great. Even the default lock screen is a joy. It's a splash of brightly coloured paints (think Rothko but giddy with happiness). As your finger hovers over the display to wake the screen, your nearby but not touching finger seems to swirl the paint colours. Touch it and the effect is amplified as the screen unlocks. You can waste a lot of time and battery life playing with this. The 13MP sensor on the Note 3 is decent enough, managing good shots in average light and excellent ones in brighter lighting conditions. Good, then, but not the standout feature here. That's because there's a video camera here too and it shoots in 4K resolution. Twice the resolution of HD in each direction, then. The results looked pretty spectacular on an HD TV but actually playing back your 4K footage in full resolution requires a 4K TV, which aren't that common just yet. Still, it's something for the future. The fast Qualcomm Snapdragon 800 processor is superbly whizzy and as a result this is a speedy phone that never slows down. There are a lot of really nippy handsets now, such as the new iPhone 5s, and though in day-to-day terms it's good to have web pages that open quickly and quick animated effects throughout, it's when apps are developed to make use of this speed that we'll really see the difference. For now, though, this is a fast handset. A phone this size has plenty of need for power with all that screen real estate to light up. On the other hand, there's room for a big cell. So the 3200mAh battery on board delivers a lot of juice. On light usage this phone will easily last you a day and a half, while heavier use will still see you glide through the day to recharge it overnight. Samsung quotes 420 hours of standby or 21 hours of talktime. Both seem pretty extreme but the reality is this is not a phone that goes to sleep at lunchtime. The real question with a Samsung Galaxy Note 3 is whether you think it's more convenient to carry a phone or tablet or a combination of the two. As tablet/phone hybrids go, the Samsung Galaxy Note 3 is hard to beat. The screen is gorgeous, the processor means it's mighty fast and the camera is excellent – especially the 4K video recording. Battery life is more than decent and the features offered by the S pen stylus are neat. And the handwriting recognition is good. If you like a big screen, the Samsung Galaxy Note 3 is worth a look – it's the best phablet yet. However, for many, the screen is just too large and cumbersome to use, making this something of a niche product for gadget fans with hands like shovels. Has Samsung added enough new features that make the Note 3 a better buy than the Note 2?